Wow! That is just amazing. In any event, that's a LOT of thread! But you have made so many wonderful things with the thread, that's even better. That is a ton! I am glad you are using those leftovers that seem to discarded; I am doing that too! That's an awful lot of stitching!! Wow! That's a lot. Happy New Year, Nancy! That's a lot of stitching to have used all that thread. Now - what to do with the reels. Can they be repurposed or are they destined for the trash now that they have fulfilled their purpose. Oh wow! Even with partial spools, that's a lot of thread. So many are thankful you quilt. What's next? Well that was both genius and fun! That's a lot of spools! I've never kept track but maybe I should. Wow, what a cool way to track your productivity! 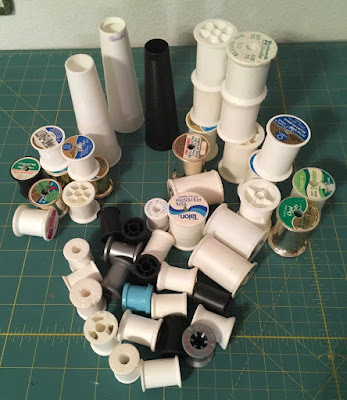 I used to love playing with the empties when I was a kid while my Mom sewed. Great idea to see how much thread gets used in a year!!!!! Have a happy new year!!!!! So clever to mark your progress with empty spools!